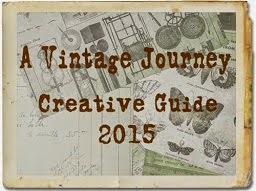 An exciting new Journey and new challenge blog ...A Vintage Journey! Well today is the day to unveil and invite you all to be part of a new and exciting vintage journey....next Friday sees the start of a brand new vintage inspired challenge blog. 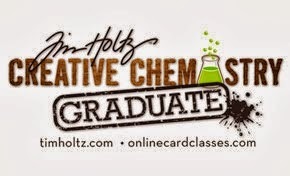 I am thrilled and proud to say that I am part of this new and exciting design team! 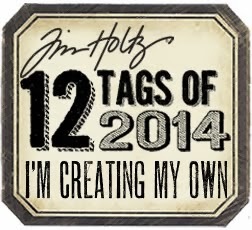 This is going to be the start of such a great adventure and hopefully you will join us!! Just wait to you see the rest of the team...its amazing and I am so excited ! 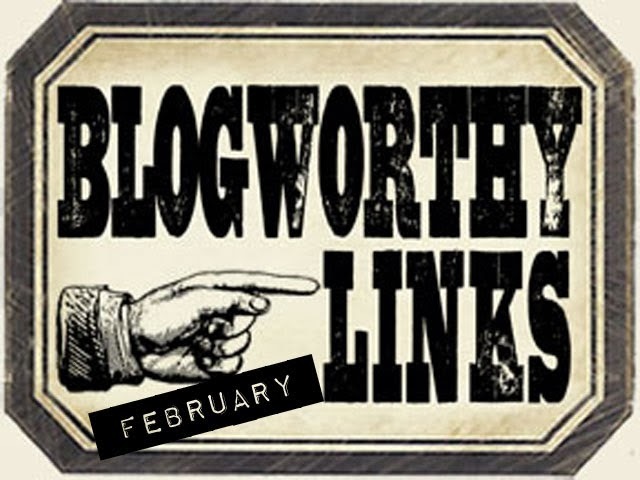 The blog will be full of inspiration from an amazing team...believe me there is such huge talent here ...including tips , techniques and a fortnightly DT focus where a Tim product or technique will be showcased. I am beyond excited and cannot wait to get started ...hope you will hop across here and join in all the fun ...and hope to see you next Friday for our first challenge. for all the details please hop across here. 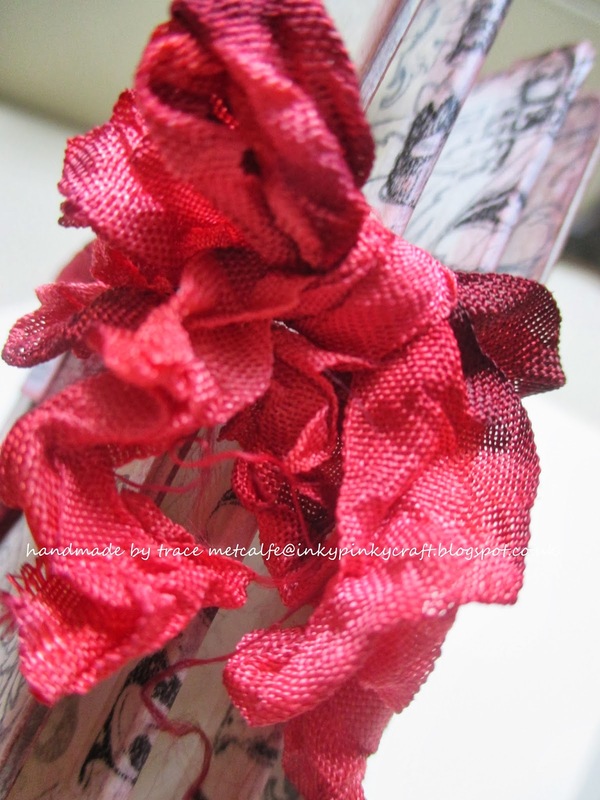 Well it is my turn to the Friday focus over at Frilly and Funkie DT and as usual I have got a bit carried away...and made a trio of tags ...if you want to see more make sure you pop across here to see all the details and all the three tags . Hi there. Jenny (Buttons) here to host the latest challenge here at Frilly and Funkie. Flowers are a definite winner at any time of the year and for all occasions, and we saw lots of them at the recent Winter 2014 CHA show. With all those new dies and stamps hitting the shelves it's time toshow us your blooms (flowers)! The twist is they must be handmade. 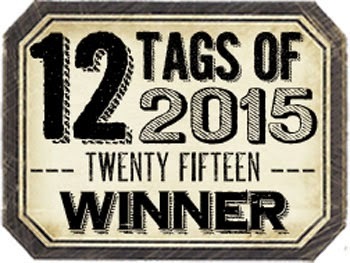 Put them on tags, cards, home decor pieces, whatever you like. Then share them with us here to be in with a chance of winning a Guest DT spot here at Frilly and Funkie or a $25 spending spree at The Funkie Junkie Boutique! Remember, to enter you must create a new project, link it below and make sure you add a link in your post back to this challenge. You can combine our challenge with up to 10 challenges (including this one) to be in with a chance of winning. inks, corrugated card given a good spritz ( with re-inker sprays...).I love playing with distress in all its forms..
Like flowers themselves bloom and grow so did this piece , evolving and changing as it went and I loved every second, can you tell!? 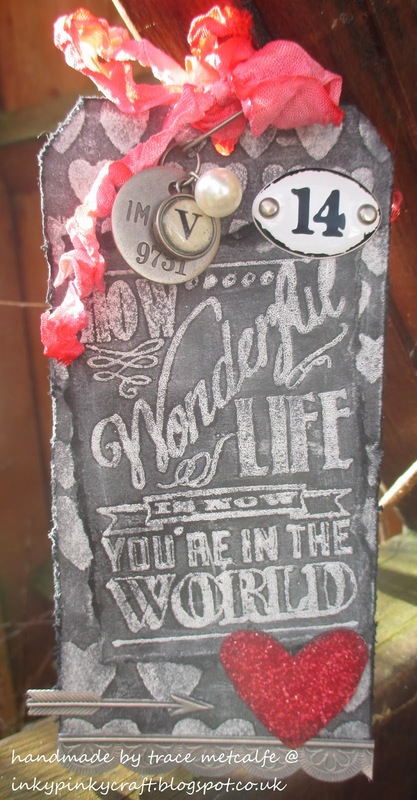 a large tag layered with die cuts, painted with gesso and sprayed ..ooh and some more trails of hot glue! 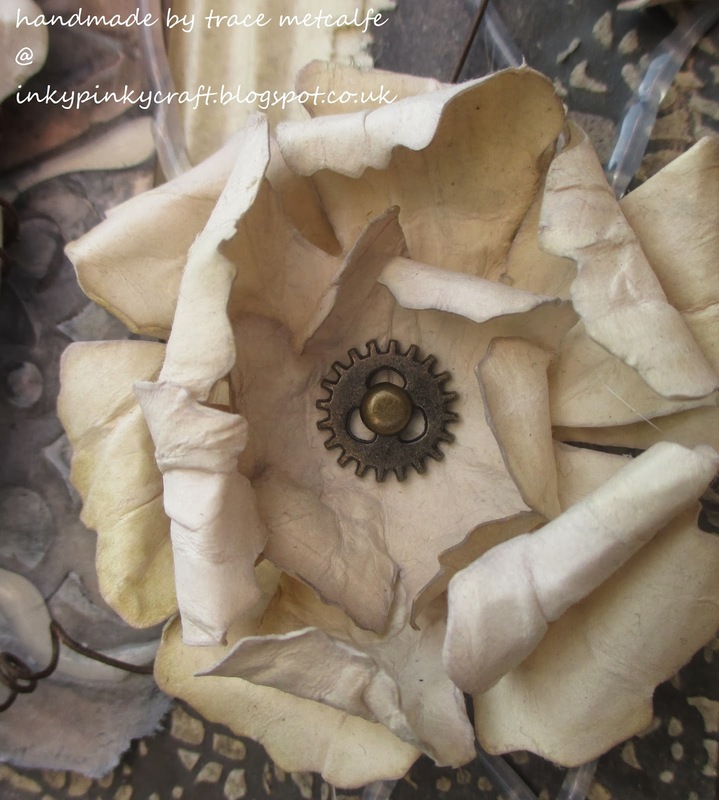 Then onto the flowers for my hidden little space....made using the tattered floral die....and of course some cogs...and rusty wire...well I had too ! I had such a great time getting lost in the moment making this piece, which didn't turn out at all how I had imagined but never the less a fun journey and enjoyable creating...and that makes for happiness in itself! For some more beautiful blooms make sure you pop across here to see some fab makes from my team mates. Hopefully you will find time to join us and make some blooms of your own and join in the competition. 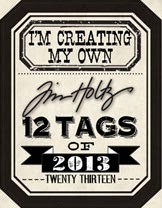 Well another month and another tag from Tim Holtz for inspiration...I have completed 20102 and 2013 so am determined to complete this year too...So onwards for my tag I used the layout of Tim's fab tag ...found here but decided to make mine sightly different and go chalkboard mad! 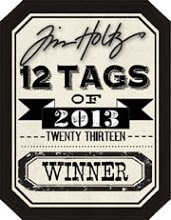 so I am linking this up to tim's 12 tags ...february tag here ..
Well this is just for me , so that I can save the details of this post found here... for I was thrilled, proud, giddy as a kipper and more to have been awarded one of Tim's blogworthy links and want to say a huge thanks to Tim Holtz for that! 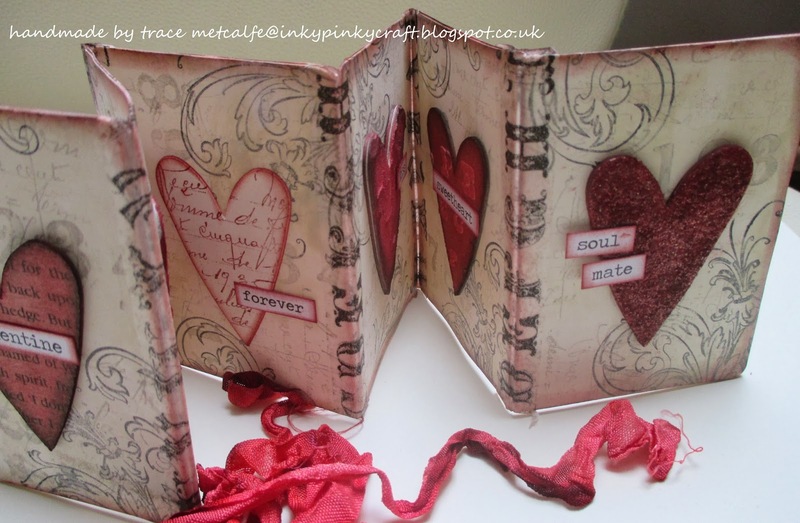 Well it is time for me to post another make and this time I have gone for a little ATC book, made from scratch using Tim dies and tissue tape...along with lots more distress goodness. 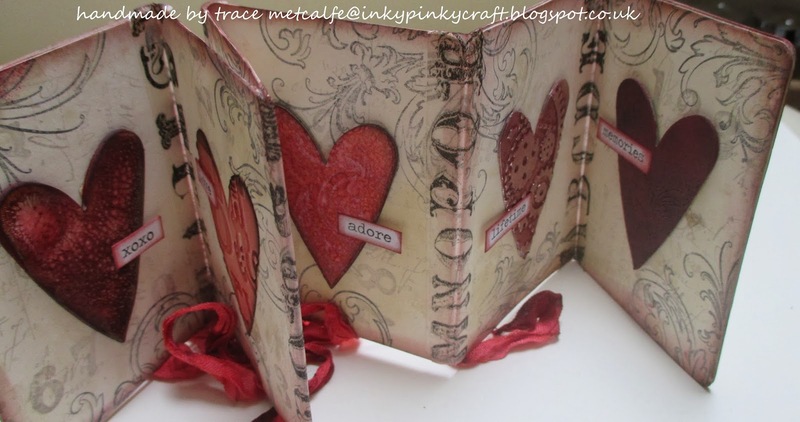 I have filled my little book full of hearts each using a different technique but this could be filled in all sorts of ways. So here my make and how I created it. So I started by cutting 12 ATC die cuts from ivory cardstock and tow from grey board ( for the cover ). I glued a piece of card onto each side of the two grey board covers and also glued all the ATC die cuts in pairs to give a double thickness. (Hope that make sense?) . I then added colour using distress paints on my craft sheet, lots of smooshing and drying later they had a base of colour. 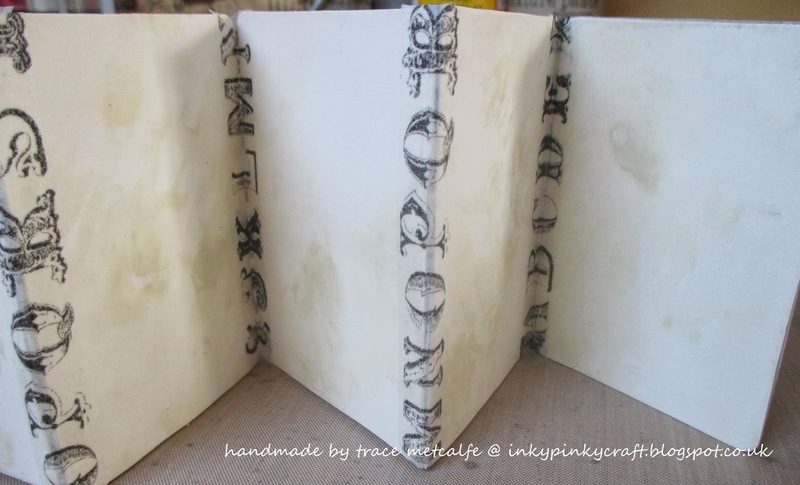 Then I attached each page together using Tim Holtz tissue tape together on each side...make sure you leave a tiny gap between the pieces so that they can fold shut ..
And completed the book by stamping the flourish in black soot distress ink.When dry I edged the pages in aged mahogany. here I used a mosaic technique and picket fence resist. 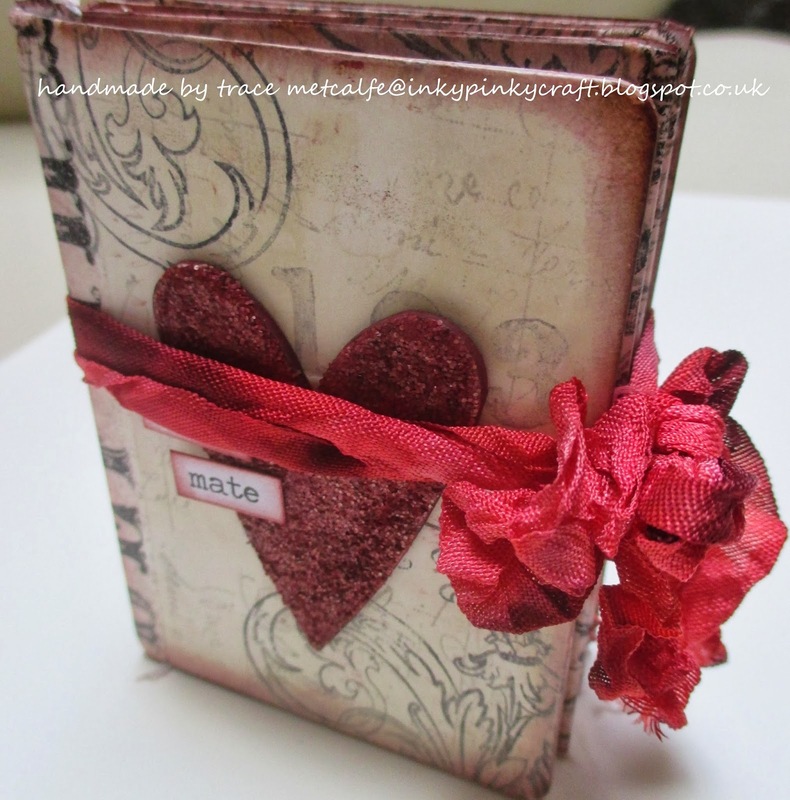 well hope you like my jam packed little make ...maybe you will be inspired to make one for a special occasions...if you do let me know I would love to see! keep those fingers inky ... and enjoy that creative journey...I sure am ! 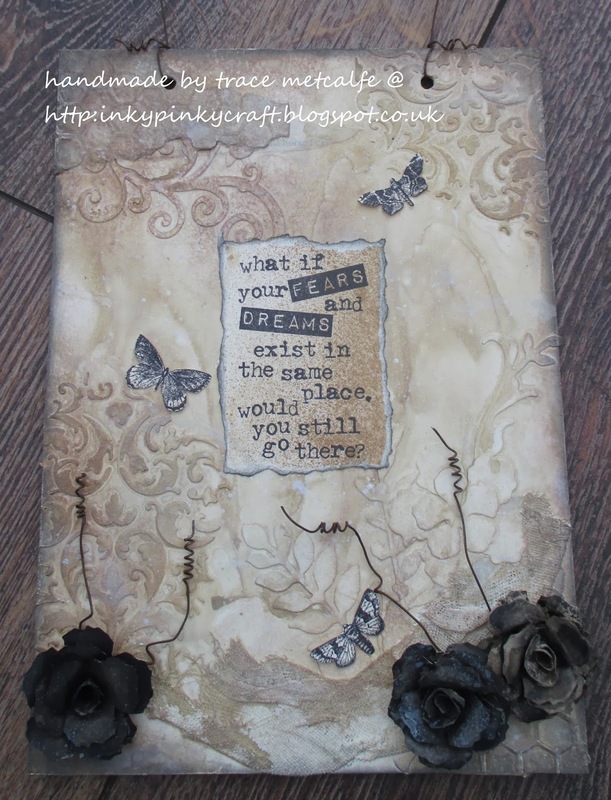 I started with a mountboard piece...I know how very predictable..and set too glueing die cut pieces and adding embossed pieces and texture paste through stencils to create layers and texture...all covered with a layer of watered down gesso. I then set too painting, spritzing and layering more painty and wateriness. To complete the piece some rusty wire twists, some butterflies and some walnut stain ink and treasure gold around the edges.